The Catit Style Hooded Cat Pan provides privacy while retaining the litter inside the pan. The large hood lifts up for easy access for cleaning, while the built-in bag anchor helps keep the bag open and frees hand for scooping. 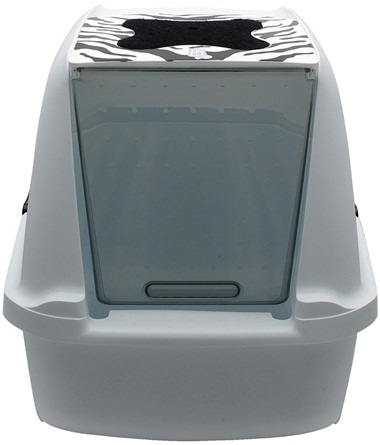 The carbon impregnated filter effectively traps and removes litter box odors. Replacement carbon filters sold separately. Catit Style Hooded Cat Pan, White Tiger Pattern. White Tiger Pattern accents with white top and gray base. With removable clear door and replaceable carbon filter. Dimensions (pan): 22.4" x 18.3" x 15.3" Dimensions (door opening): 10.4" x 9.6"